As we all come to terms with the sweltering heat and try our best not to melt into the furniture over the next few days, it’s worth remembering we’re not the only ones who need to keep cool. Two police officers in York had to smash the window of a car to free two helpless dogs, who’d been locked inside for over half an hour in the blazing sunshine. 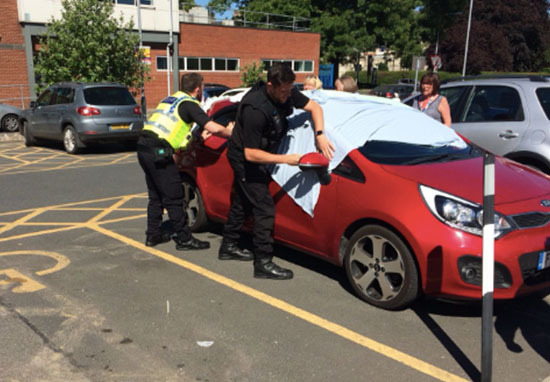 The incident happened outside York Hospital yesterday, (June 25), where temperatures reached 27C. Inside the car it would have been nearly double the temperature, reports the Metro. Officers decided to smash the car windows and free the dogs after they saw the animals ‘struggling to breathe’. Officers were in that car for thirty seconds and were struggling to breathe so goodness knows what these poor animals were going through. DO NOT LEAVE YOUR DOG IN A HOT CAR ON A SUNNY DAY! How many warnings do you need? The police contacted the RSPCA to attend to the dogs and thanked them for their ‘prompt’ attendance. When we arrived police had already removed two Labradors from the vehicle. The dogs were taken to the vets for treatment for heat exhaustion and now remain in RSPCA care. An investigation has been launched so we cannot comment any further at this time. In a separate statement, the RSPCA warned against the dangers of leaving animals in cars and how they can overheat. The RSPCA have also shared advice on what to do if you see dogs in hot cars, and how to treat an animal suffering from heatstroke. York Police also tweeted to say, if you see a dog in a car and feel the need to free it, always ‘make sure you’re able to justify your actions’. Thanks to the actions of the police, the dogs are now recovering in the care of the RSPCA.